Manchu manoj is currently busy with the shooting of “Current teega” at ramoji film city. Movie unit is shooting a fight sequence on Manoj. 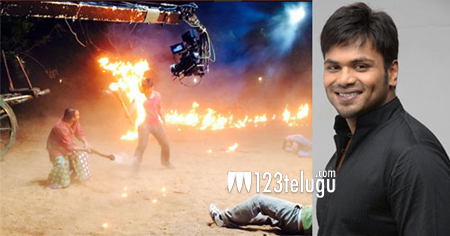 Manchu manoj was doing a stunt in fire and suddenly his body caught fire. Team unit reacted immediately and helped Manoj to escape from danger by using water and dirt available nearby. This is not the first time Manoj is taking a risk and is known for his stunts in many movies. G.Nageswara Reddy is directing this movie which is featuring rakul preet singh as the female lead. Sunny Leone is donning a crucial role. Important scenes were shot recently on Manchu Vishnu, Sunny leone and others. Manchu Vishnu is producing this movie. Movie Unit is making things happen really fast and planning to release the movie in August.